Parthenocarpy, or fruit set and growth without fertilization, is a desirable trait in tomato cultivation as it reduces the cost of tomato production. 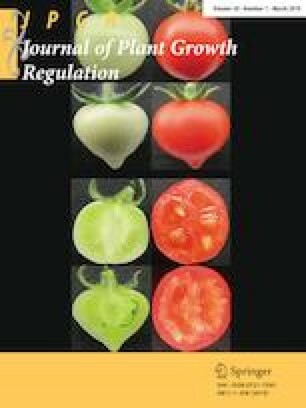 MPK-1 is a Japanese parthenocarpic tomato cultivar, and the gene responsible for parthenocarpy of MPK-1 is Pat-k. As MPK-1 is a stable parthenocarpic tomato cultivar, we investigated the physiological mechanism of parthenocarpy in this cultivar. Indole-3-acetic acid (IAA) is considered as the main factor contributing to parthenocarpy, as its exogenous application to unpollinated ovaries triggers parthenocarpic fruit development in tomato. In this study, we investigated the level of IAA and its metabolites and the expression of genes involved in IAA metabolism in unpollinated ovaries of MPK-1. We observed an increase in the level of IAA accompanied by an elevated level of expression of an IAA biosynthesis gene, ToFZY5 in parthenocarpic ovaries of MPK-1. Simultaneously, the level of IAA-glutamate (IAA-Glu), one of the IAA conjugates comprising a potential IAA inactivation pathway, was also increased. These results suggest that the increase in IAA levels, driven by the up-regulation of IAA biosynthesis genes, promotes the growth of parthenocarpic fruits in MPK-1, and that the IAA synthesized in parthenocarpic ovaries is primarily metabolized to IAA-Glu. In addition, expression profiles of some genes involved in IAA metabolism were different between pollinated and parthenocarpic ovaries, suggesting that the specific transcriptional regulation of IAA metabolism in parthenocarpic ovaries of MPK-1 differs from that in pollinated ovaries. The online version of this article ( https://doi.org/10.1007/s00344-018-9826-7) contains supplementary material, which is available to authorized users. This work was supported by a Grant-in-Aid for Young Scientists (B) [15K18639] from the Japan Society for the Promotion of Science.